Creatine Super Feature - Part 7: Creatine Use Guide. This section presents an overview of the dosing regimens that were clinically validated to produce beneficial effects from ingestion of a creatine monohydrate. Also mentioned are studies where stacking creatine with other substances has varying results. This section presents an overview of the dosing regimens that were clinically validated to produce beneficial effects from ingestion of a creatine monohydrate containing supplement. Creatine monohydrate is the ingredient of choice based on the results of over 200 clinical studies that prove creatine monohydrate works best. Regarding other forms of creatine there is currently no evidence that these other forms of creatine produce better results than creatine monohydrate. There is evidence that indicated combining creatine monohydrate with other substances may enhance creatine uptake in to the body, which will also be reviewed in this part. There is also the issue regarding the intake of caffeine with creatine, which the research will be reviewed in this part. This part will end with an overview of the safety issues regarding the use of creatine supplementation and a short overview on additional types of creatine, like creatine ethyl ester. Even though there are numerous clinical studies conducted using creatine monohydrate supplementation, there are still some unanswered questions. As I indicated in the previous parts, scientists sometimes get caught up in the "blind leading the blind" syndrome. As this related to creatine supplementation, most of the studies have followed a generalized creatine loading period, followed by a lower dosage maintenance period. Other studies have focused their attention on determining what the lowest effective daily dose of creatine that would produce beneficial results. Most of the studies have focused on the pharmacological properties of taking creatine supplements; its effects on the body. This leads me to a point, which is also underscored by researchers Adam Persky and Gayle Brazeau, from the University of Florida, College of Pharmacy, in their review paper titled "Clinical Pharmacology of the Dietary Supplement Creatine Monohydrate". Persky and Brazeau point out that there is a future research need to fine-tune our understanding of the "pharmacokinetics" of creatine supplementation. While pharmacology is the general term that encompasses the effects a substance produces in the human body, pharmacokinetics is the study of the bodily absorption, distribution, metabolism, and excretion of substances, in particular drugs. The principle also applies to nutrients taken for health and athletic performance. The main point I want to make regarding this lead-in to creatine dosing and use is due to the fact that pharmacokinetics has not been clearly defined. There may be opportunity to refine the creatine dosing regimen based on future research and fine-tuning of the dynamics of creatine supplements in the human body. As you learned in previous parts, some of the research studies calculated the creatine dosages based on lean body mass, or body weight. But, the dosages were based on either lean body mass or body weight, meaning that there is no clearly established body weight based dosage method. This body weight dosing approach is an interesting trend, but far from being finalized or confirmed. With this in mind, the following dosage information is based on the results of the majority of research studies reporting beneficial effects of creatine supplementation. This information is for healthy adults, and creatine and other supplement use is best accomplished under doctor supervision, as this or any publication is not intended to replace medical advice or medical supervision. Use under medical supervision for safe and effective results. For healthy individuals only, who are engaged in strength training, muscle building and strength sport training and competition season. Individual results will vary. Preferred Creatine Type: Creatine Monohydrate powder or chewable tablets. Duration of Use: 7 days. Ingest in 4 to 6 divided dosages each day. Take 60 to 30 minutes before meals. Or take with meals if gastrointestinal upset is experienced. If gastrointestinal upset persists, reduce the daily dosage to the maintenance dose regimen, realizing that it will take a few weeks longer to achieve increased creatine body levels that will results in the desired benefits. Optional. Consumption of a glucose beverage 30 minutes after creatine consumption. Avoid mixing acidic beverages with creatine. Ingest in 1 to 2 divided dosages each day. Or take with meals if gastrointestinal upset is experienced. Can also take a creatine combination product that includes glucose, protein, amino acids, vitamins, minerals, and other sports nutrition ingredients. Note: taking creatine with whey protein supplements can significantly improve the benefits. Use a product that contains whey protein isolate for best results. Try Explosive Growth Blendâ„¢, which is over 20 of the most effective muscle building products in one convenient formula made using proprietary SynerBlendâ„¢ technology. This will get you the best results for less money. Preparation: the best preparation method is dissolving creatine monohydrate powder in to water. Pure creatine monohydrate has a solubility of about 7 to 8 grams in 500 ml of water. Warmer water can dissolve more creatine per ml or water. Consume your creatine solution after mixing the powder into solution. High quality creatine should easily dissolve. A poor dissolving creatine product is a sign that it might not be high quality. Creatine can also be mixed with non-acidic beverages, like milk. Creatine monohydrate can be taken with other supplements, such as vitamins and minerals, protein powders, etc, or as part of a complex supplement formula where creatine monohydrate is one of the ingredients. The most important factor to taking creatine is to be consistent and take it on a regular basis. It takes several days for the muscle cells to increase total creatine and creatine phosphate levels, and using the maintenance dose every day keeps the muscle tissue levels saturated. Avoid continuous and high caffeine consumption while taking creatine supplements. Also avoid or minimize alcohol consumption during training and competition seasons; alcohol interferes with protein synthesis, promotes dehydration, and causes cellular damage. This Table is copyright protected. Copyright Â© 2005 By SUPPLEMENTFACTS International LLC. All rights reserved. Contact dan@supplementfacts.com for reprint permission. www.supplementfacts.com. Some research studies have examined the effects of combining creatine with other nutrients to determine if creatine uptake is enhanced or if there is a synergistic effect. The following is a review of some of the recent research regarding combining creatine with other nutrients, including protein, carbohydrates, glutamine, magnesium and alpha-lipoic acid. To be comprehensive and objective I included applicable research summaries, weather they reported a synergistic ingredient effect or not, to serve as a handy reference as these studies are sometimes referred to in articles or advertisements. As you will see, some are indeed synergistic and some are not. "Combined creatine and protein supplementation in conjunction with resistance training promotes muscle GLUT-4 content and glucose tolerance in humans." This study was undertaken by Derave and coworkers (34) to determine the effects of creatine monohydrate and creatine plus protein supplementation on GLUT-4 and glycogen content of human skeletal muscle. Note that GLUT stands for glucose transporter. There are 5 main GLUT's that tend to be tissue specific, and GLUT-4 is more abundant in skeletal muscle tissue and also adipose tissue. This double-blind, placebo-controlled trial was performed using 33 young healthy subjects (26 men and 7 women). The subjects' right legs were immobilized with a cast for 2 wk, followed by a 6-wk resistance training program for the right knee extensor muscles. The participants were supplemented throughout the study with either placebo (maltodextrin) or creatine & maltodextrin, or with creatine plus protein during immobilization and creatine plus protein, maltodextrin, amino acid blend, and multivitamin blend during retraining. Muscle biopsies were taken from the vastus lateralis. The researchers determined that GLUT-4 protein expression was reduced by the immobilization in all groups. During retraining, GLUT-4 content increased in both the creatine (+24%) and creatine-protein (+33%) taking groups, which resulted in higher post training GLUT-4 expression. Compared with the placebo group, the muscle glycogen content was higher in the trained leg in both creatine and creatine-protein groups. Supplements had no effect on GLUT-4 expression or glycogen content in contralateral control legs. Area under the glucose curve during the oral glucose tolerance test was decreased from 232 mmol. per liter per minute at baseline to 170mmol. per liter per minute at the end of the retraining period in creatine-protein group, but it did not change in the creatine or placebo groups. The researchers concluded that creatine intake stimulates GLUT-4 and glycogen content in human muscle only when combined with changes in activity level, and that combined protein and creatine supplementation improved oral glucose tolerance, which is beneficial to both athletes. "The effect of whey protein supplementation with and without creatine monohydrate combined with resistance training on lean tissue mass and muscle strength." The purpose of this research study conducted by Burke and coworkers (35) was to measure muscular developments during 6 weeks of resistance training, among 36 males who were randomly assigned to supplementation with whey protein, whey protein and creatine monohydrate, or a placebo (maltodextrin). Lean body tissue mass increased to a greater extent in the whey-creatine group compared to the other groups; and also in the whey group when just compared to the placebo group: + 4 kg, 6.5% in the whey-creatine group; +2.3 kg, 3.8% in the whey group; and +0.9 kg, 1.5% in the placebo group. Bench press strength increased to a greater extent in the whey-creatine group compared to the other groups: +15.2 kg, 17% in the whey-creatine group; 6.3 kg, 7% in the whey group; and 7.2 kg, 8% in the placebo group. Knee extension peak torque increased significantly with training in the whey-creatine and whey groups, but not for the placebo group. The researchers also observed that continued training for an additional 6 weeks without supplementation resulted in maintenance of strength and lean tissue mass in all groups. The results of this study revealed a synergistic effect among males taking the whey protein and creatine supplement, which resulted in greater increases in lean tissue mass and bench press performance. Creatine Monohydrate and Alpha-lipoic Acid? "Effect of alpha-lipoic acid combined with creatine monohydrate on human skeletal muscle creatine and phosphagen concentration." The purpose of this study conducted by Burke and coworkers (36) was to determine the effect of alpha-lipoic acid on human skeletal muscle creatine monohydrate uptake by directly measuring intramuscular concentrations of creatine, phosphocreatine, and adenosine triphosphate when creatine monohydrate was co-ingested with alpha-lipoic acid. Muscle biopsies were acquired from the vastus lateralis (a muscle of the upper leg) of 16 male subjects age range from 18 to 32 years. After the initial biopsy, subjects ingested either 20 grams per day of creatine monohydrate, 20 grams per day of creatine monohydrate plus 100 grams per day of sucrose, or 20 grams per day of creatine monohydrate plus 100 grams per day of sucrose plus 1000 milligrams per day of alpha-lipoic acid for 5 days. Body weight increased by 2.1% following the supplement taking, with no differences between the groups. There was a significant increase in total creatine concentration following creatine supplementation, with the group ingesting alpha-lipoic acid showing a significantly greater increase in phosphocreatine. However, as I previously mentioned, most of the studies using glucose or other carbs in association with creatine loading do not measure outcomes, such as increases in lean body mass, increases in strength, or increases in athletic performance. For example, in this study the outcome of increasing body weight was the same for all of the groups, so creatine monohydrate worked just as good when compared to the other combination dosages for increasing body weight. Additionally, 1000 milligrams of lipoic acid is very expensive, and as the previous studies demonstrated, combining creatine with whey protein, produces significant and quite impressive synergistic results in increased lean body mass and strength. "Magnesium-creatine supplementation effects on body water." This study conducted by Brilla and coworkers (37) evaluated magnesium-creatine supplementation on body water and quadriceps torque. The following supplements were used in this study, in three different groups of subjects: Maltodextrin as the placebo; Magnesium oxide plus Creatine monohydrate, at 800 mg magnesium and 5 grams creatine per day for 2 weeks; Magnesium-creatine chelate, at 800 mg magnesium and 5 grams creatine per day for 2 weeks. Body weight of the subjects increased for both of the magnesium - creatine treatment groups; average increase of 0.75 kilograms in the magnesium oxide - creatine group, and 0.4 kilograms in the magnesium-creatine chelate group. Both treatment groups had increased power. However, these increases were not greater then taking creatine monohydrate alone, when compared to other studies conduced using creatine monohydrate. "The effects of 8 weeks of creatine monohydrate and glutamine supplementation on body composition and performance measures." This study conducted by Lehmkuhl and coworkers (38) used twenty-nine athletes, 17 men and 12 women, who were collegiate track and field athletes. Ten were randomly assigned to take creatine monohydrate, ten to take creatine monohydrate and glutamine, and nine to take a placebo. 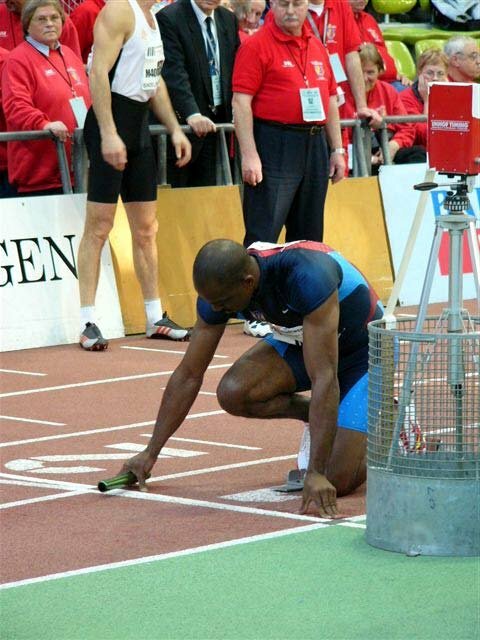 Bodybuilding.com Writer, Dexter McCloud Preparing For The 4x200 Relay. The creatine monohydrate taking group received 0.3 grams creatine per kilogram of body mass per day for 1 week, followed by 0.03 g creatine per kilogram of body mass per day for 7 weeks. The creatine monohydrate - glutamine taking group received the same creatine dosage scheme as the creatine monohydrate taking group plus 4 grams of glutamine per day. All 3 treatment groups participated in the same strength and conditioning program during preseason training. Measurements observed during the study included body composition, vertical jump, and cycle performances before and after the 8-week supplementation period. After the study period it was determined that body mass and lean body mass increased at a greater rate for the creatine monohydrate and creatine monohydrate - glutamine taking groups, compared with the placebo treatment. Additionally, the creatine monohydrate and creatine monohydrate - glutamine taking groups exhibited significantly greater improvement in initial rate of power production, compared with the placebo treatment. These results provide evidence that the creatine monohydrate, with or without glutamine produces significant benefits.
. In the 2003 study headed by D. Preen, the same study design was used, one in which the creatine + glucose subjects did not undergo a strength training program (38-40). These studies also do not report significant outcomes that have been previously reported for taking creatine alone, such as increases and strength or athletic performance, as the subjects were not required to exercise during the study period. With one exception, the 2003 study included a group that took creatine and an under went a 60 minute session of cycling exercise each of the 5 creatine loading days. The overall results indicate that taking creatine alone will result in significant increases in total body creatine and phosphocreatine, but that taking creatine with glucose resulted in achieving higher levels during the loading phase. During the maintenance phase, only creatine was ingested, without the ingestion of a glucose drink. In the 1996 studies subjects ingested 20 grams of creatine a day, and 370 grams of glucose per day, in 4 divided dosages. In the 2003 study, on average 144.6 grams of glucose was consumed per day, with the 20 grams of creatine. The glucose beverage was actually consumed 30 minutes after the subjects ingested the creatine solution. Based on the total body of research, creatine monohydrate taken alone is effective. During the loading phase, creatine plus glucose may result in higher levels of creatine and phosphocreatine, under conditions of not exercising. However, more research is needed to compare the effects of creatine versus creatine + glucose loading, while the subjects are undergoing strength training, and comparing the effects on athletic performance. So, it is optional to take creatine with glucose or other carbohydrates, especially if you take creatine 30 to 60 minutes before a meal, or even with meals, your meal will provide insulin stimulating nutrients. However, most people who are training intensively can probably use some extra glucose to help replenish their muscle glycogen. Find out how many grams of protein, carbs and fat are in the foods you eat, along with the full vitamin and mineral profile. The take home lesson is that creatine monohydrate on its own produces great results. Taking it with other nutrients like protein, glutamine, glucose, etc, may provide additional benefits. As a consumer, the decision ends up to what you can afford. So purchase the value added formulas when you can afford to do so. At the very least taking a multi-vitamin/mineral, protein supplement and creatine supplement is the minimum supplement requirements for bodybuilders and strength athletes in training and competition. Creatine Monohydrate Powder More Is Effective Than Creatine Liquid. "Creatine serum is not as effective as creatine powder for improving cycle sprint performance in competitive male team-sport athletes." This study conducted by Gill and coworkers (41) examined the effects of supplementation with either creatine monohydrate powder prepared in solution versus a commercially available creatine liquid. The performance test used in this study was a repeated maximal sprint cycling test; 10 x 6 seconds, 24-second passive rest between sprints. This study used a randomized, double-blind, crossover design. Eleven competitive male athletes supplemented with creatine. Five milliliters per day for 6 days of creatine serum product. The results showed that the subjects taking the creatine powder in solution had an increase in total work (9.6%) and peak power (3.4%) in the cycle sprint. However, there was little change after using the creatine serum supplement product. The results of this study reconfirmed that creatine monohydrate powder can produce an ergogenic effect. The researchers noted that the creatine serum may have been ineffective because there is a substantial conversion of creatine into creatinine when in solution for long periods of time, and that the creatine serum product probably had little creatine remaining in it, versus the freshly prepared drink made using creatine powder. This study illustrates an important point regarding the stability of creatine in solution. When creatine is mixed with water, or other fluids, some of the creatine will eventually start to convert to creatinine. It usually takes a few to several hours for this to start to happen. The rate of this creatine to creatinine conversion is increased as the pH of the liquid is decreased; more acidic fluids. Creatine beverages, made from creatine powder should be consumed with in an hour of mixing the creatine powder in the fluid to ensure that you will be ingesting 100% creatine. You should also avoid mixing creatine with acidic beverages. If you need to premix your creatine, you can greatly slow down the conversions of creatine to creatinine by refrigerating your creatine beverage. "Absorption of creatine supplied as a drink, in meat or in solid form." In this study Harris and coworkers (42) examined the plasma concentration over 6 hours after the ingestion of 2 grams of creatine (equivalent to 2.3 grams creatine monohydrate) contained in meat, creatine lozenge (crushed in the mouth and swallowed) or in creatine monohydrate supplement prepared with water in five non-users of creatine supplements. The creatine supplement powder prepared with water resulted in a significantly more rapid and higher plasma creatine concentration than from the meat or a creatine lozenge. Despite a possibly lower bioavailability, 2.3 grams of creatine monohydrate supplied in either solid form was nonetheless sufficient to raise the plasma concentration five- to six-fold in individuals with a mean body mass of 75.6 kg. The research regarding caffeine and creatine also deserves some discussion in light of the complicated research findings. When the notable 1996 study was conducted, see study reference below, the researchers actually thought that caffeine ingestion might enhance creatine uptake. During the 1996 study creatine and phosphocreatine levels increased in both dosage regimens; creatine, and creatine plus caffeine. However, only the creatine group experienced an improvement in muscle strength performance. In both the 1996 and 2002 studies (43 & 44), caffeine intake was very high for a 3 day period, 5 mg per kg of body weight, about 350 mg per day of caffeine intake. Creatine aside, in these and other studies, caffeine intake has been shown to increase the muscle resting time during the muscle contraction cycle. Creatine actually decreases the muscle resting time, which is beneficial for strength athletes as this speeds-up the muscle contraction cycle. During fast repetitive muscle contractions shorting of the muscle resting time from a previous contraction is critical to maximum force output during the next muscle contraction. Also, shortening muscle resting time may increase the number of actin-myosin activation cycles per unit of time and increase total muscle power output. My general recommendations regarding caffeine consumption for strength athletes is to minimize and avoid caffeine intake during periods of training and competition. Ingest caffeine sparingly, only periodically, for one day at a time, with a few days in between the next ingestion; if you find that you need to consume it at all. The aforementioned studies measured the effects of a single day of ingesting caffeine (referred to as acute caffeine intake), which did not adversely effect muscle strength performance; however, it did not improve performance significantly. While we are on this subject, alcohol consumption also undermines your muscle building efforts. It actually interferes with protein synthesis. So during those important training and athletic season periods, it is best to avoid caffeine and alcohol intake. The thrill of competition should give you enough of a high. As an aside, moderate caffeine use by endurance athletes has been shown to improve their performance significantly in most studies. Although, keep in mind that caffeine misuse and over consumption is counter productive. Additionally, some sports governing organizations have limits on the levels of caffeine permitted. Check with your organization to make sure you don't get disqualified from being a caffeine drinker. As indicated in the Kreider study, and in all of the other studies reviewed herein, it turns out that under the conditions of these studies, creatine is proven to be both safe and effective. The reports of creatine causing cramps, are unproven. In fact, the most recent research reports the opposite; creatine use by athletes actually reduces the incidence and duration of muscle cramps. Gator Agility And Foot Quickness Training. However, even though studies range up to 3 years in length of continuous creatine monohydrate supplement use, there are still unanswered questions regarding all of the potential effects that long-term creatine use may have. So to be on the safe side plan on creatine use during periods of intensive training and during the athletes season. Continuous use lasts up to 4 months in length. Then, abstain from creatine for 4 weeks or more. When you repeat use, follow the standard creatine loading, and maintenance regimens, as after 4 weeks your body returns to near pre-creatine use levels. Creatine supplements should not be used by anyone who has any disease or disorder, without being under strict doctor supervision. People with a history of renal dysfunction or diabetes should avoid creatine supplementation. In 2003, the results of another study performed using football players also reported no side effects from taking creatine monohydrate supplements. Greenwood, Kreider, Greenwood and Byars recorded the results of Division IA collegiate football players over a 4 month period that included training sessions, practices, and competition. The creatine taking group of football players loaded with creatine monohydrate for 5 days (0.3 g/kg body weight), and during the 115 day maintenance period consumed creatine at the rate of 0.003 g/kg of body weight) (45 & 46). At the end of this study period the researchers reported that creatine users experienced a reduced incidence of the following when compared to the placebo group: reduced rate of cramping, reduced heat/dehydration, reduced muscle tightness, reduced muscle strains, reduced non-contact injuries, reduced illness, reduced number of missed practices and reduced number of players lost for the season. "Creatine supplementation and its effect on musculotendinous stiffness and performance." This study was undertaken by Watsford and coworkers (47) to determine if any side effects would occur from taking a creatine monohydrate supplement. Twenty men were randomly assigned to a control or an experimental creatine supplement taking group. Subjects were examined for musculotendinous stiffness of the triceps surae and for numerous performance indices before and after the creatine ingestion period. It was determined that the creatine taking group experienced a significant increase in body mass, and also an increase in jump height performance. No increase was found for musculotendinous stiffness from taking creatine. The findings of this study do not support the speculation that creatine supplementation causes muscular strain injuries. Additionally, the increase in jump performance demonstrates the performance enhancement in activities requiring maximal muscle power output. The following information is a quick overview of the research studies published, or lack of research studies published using other forms of creatine. You may be wondering why companies would go through the trouble and expense to reinvent something that already works so well; creatine monohydrate. One school of thought is that by connecting a different molecule to creatine, it may get in the body at a faster rate, and increase total creatine and phosphocreatine levels greater than creatine monohydrate. The big question we all want to know the answer too, putting all of the marketing hype aside, is has anyone actually invented a better form of creatine? Answer: NO! At the time of writing this article there was no scientific evidence supporting that other forms of creatine work better than creatine monohydrate. This includes the popular creatine ethyl ester HCl (CEE). As it turns out, there is a lack of published research conducted with humans using CEE. Based on data submitted to the FDA by a CEE raw material manufacturer, the FDA noted that according to the rat study, the CEE dissociated in to creatine and ethanol in the gut before being bioavailable to the tissues. The FDA also noted that the rat study data did not show an increase in creatine blood levels in the rats that ingested the CEE. The FDA stated that the study failed to provide data showing that creatine levels were increasing as CEE dissociates and diffuses from the gut into the blood. This study did not clearly demonstrate the relative concentration of CEE, creatine, and ethanol between the gut and blood especially during the first three hours after intake. It is unclear to FDA how creatine/creatinine levels in the urine could be detected yet there were no recorded measurements for creatine in the blood during the first 190 minutes of the experiment. In all fairness to the CEE company, perhaps CEE is not as bioavailable in rats as it might be in humans. However, in this regard it is interesting to note that in the CEE patent, the illustration identifies CEE as "biologically inactive", then shows some illustrations of what happens to CEE as it moves through the digestive system, where in the intestines the CEE has to be broken down by intestinal enzymes (esterase), and freed in to creatine monohydrate before it can be taken up in to the blood stream and delivered to the muscles. So, putting all of the CEE marketing hype aside, there is currently no scientific evidence that CEE works better than creatine monohydrate. In fact the CEE molecule has to be digested in the intestines to free up creatine monohydrate to be absorbed in to the body. Based on data submitted to the FDA, it appears that this digestion of CEE in the intestines may be incomplete, and in the end not be very bioavailable. Perhaps in the future there will be some humans studies conducted using CEE compared directly to creatine monohydrate to determine if it is safe and effective in humans, and if effective, how it actually compares to the beneficial effects of research proven creatine monohydrate, which I look forward to reporting about in future editions of this article. If you are going to try CEE products, it would probably make sense to do this in the off season, as the expectation of CEE producing benefits is questionable. "Effects of oral creatine-pyruvate supplementation in cycling performance." This double-blind study conducted by Van Schuylenbergh and coworkers (48) was performed to evaluate the effects of creatine-pyruvate supplementation on exercise performance in well-trained cyclists. Seven athletes took 3.5grams of creatine-pyruvate twice a day for one week, and seven other athletes took a placebo. It was concluded that one week of creatine-pyruvate supplementation at a rate of 7 grams per day did not beneficially impact on either endurance capacity or intermittent sprint performance in cyclists. Other forms of creatine, such as magnesium-creatine chelate, creatine citrate, and creatine phosphate, have not been shown to perform better than creatine monohydrate. In the case of using creatine compounds with minerals attached to the creatine, such as magnesium or phosphate, there may be a concern of overdosing these minerals. Creatine intake requirement is high, especially during the loading phase, which may results in too high an intake of these mineral complexes. In summary, based on the available research, for best results, Creatine monohydrate has the most research backing its safety and effectiveness. With proper use, creatine monohydrate supplementation alone or as part of a complete custom formula, containing whey protein isolate, and other beneficial ingredients should be part of the bodybuilder's and other strength athlete's nutrition program. Derave W, Eijnde BO, Verbessem P, Ramaekers M, Van Leemputte M, Richter EA, Hespel P. Combined creatine and protein supplementation in conjunction with resistance training promotes muscle GLUT-4 content and glucose tolerance in humans. J Appl Physiol. 2003 May;94(5):1910-6. Epub 2003 Jan 10. Lehmkuhl M, Malone M, Justice B, Trone G, Pistilli E, Vinci D, Haff EE, Kilgore JL, Haff GG. The effects of 8 weeks of creatine monohydrate and glutamine supplementation on body composition and performance measures. J Strength Cond Res. 2003 Aug;17(3):425-38. Preen D, Dawson B, Goodman C, Beilby J, Ching S. Creatine supplementation: a comparison of loading and maintenance protocols on creatine uptake by human skeletal muscle. Int J Sport Nutr Exerc Metab. 2003 Mar;13(1):97-111. Harris RC, Nevill M, Harris DB, Fallowfield JL, Bogdanis GC, Wise JA. Absorption of creatine supplied as a drink, in meat or in solid form. Hespel, P., et al. Opposite actions of caffeine and creatine on muscle relaxation time in humans. J Appl Physiol 2002 92:513-518. Kreider RB, Melton C, Rasmussen CJ, Greenwood M, Lancaster S, Cantler EC, Milnor P, Almada AL. Long-term creatine supplementation does not significantly affect clinical markers of health in athletes. Mol Cell Biochem. 2003 Feb;244(1-2):95-104. Greenwood, M, Kreider, RB, Greenwood, L, and Byars, A. Cramping and injury incidence in collegiate football players are reduced by creatine supplementation. Journal of Athletic Training 2003;38(3):216-219. Watsford ML, Murphy AJ, Spinks WL, Walshe AD. Creatine supplementation and its effect on musculotendinous stiffness and performance. J Strength Cond Res. 2003 Feb;17(1):26-33. Van Schuylenbergh R, Van Leemputte M, Hespel P. Effects of oral creatine-pyruvate supplementation in cycling performance. Int J Sports Med. 2003 Feb;24(2):144-50. Dan Gastelu has worked on numerous projects with prominent health experts, such as Ben and Joe Weider and many more!